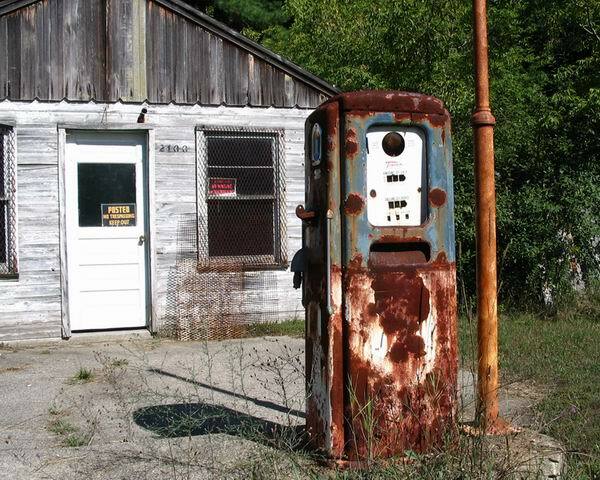 At the turn of the century, which was the dawn of the age of the automobile, the problem of storing and dispensing gasoline arose. Initially, the owner of the vehicle would buy a drum of gasoline, bring it home and dispense it as needed. For obvious reasons, this was not considered a safe or convenient method of distributing gasoline. 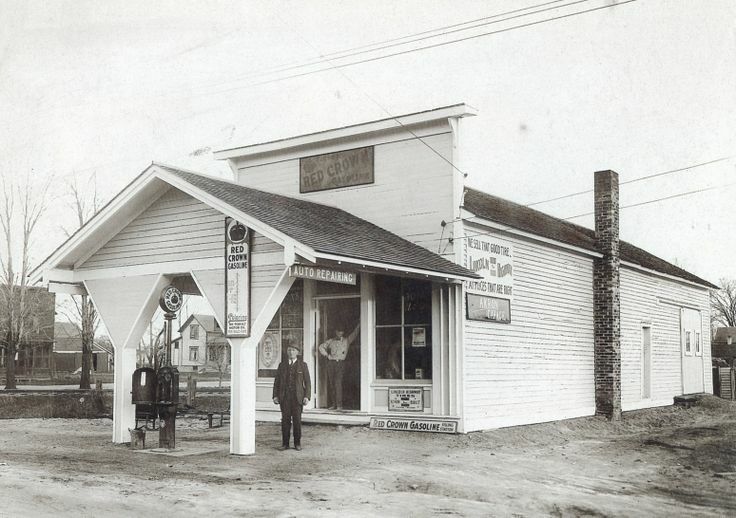 With demand steadily increasing, local business people such as blacksmith shops, hardware, and grocery stores began selling gasoline. It was still being dispensed from barrels however, which was still somewhat cumbersome. Ironically, some folks were delivering gas to homes using the very horse-drawn carts that the automobile would eventually replace. In keeping with the American tradition of constant innovation and improvement, a gentleman by the name of Sylvanus F. Bowser came up with the idea of a water pump that utilized a wooden plunger that could raise a column of fluid upward to the surface. This led to the development of the first "filling station", the precursor the curbside pump we all know today. 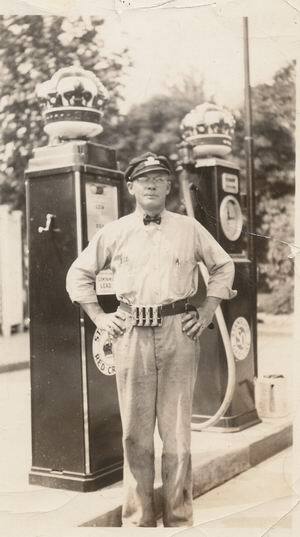 By the twenties, dozens of companies were selling gas, and most had their own version of the gas pump. A safety issue arose as the placement of the early pumps were quite near the street, often in congested areas which caused traffic jams and the occasional inferno when someone would crash into a pump. 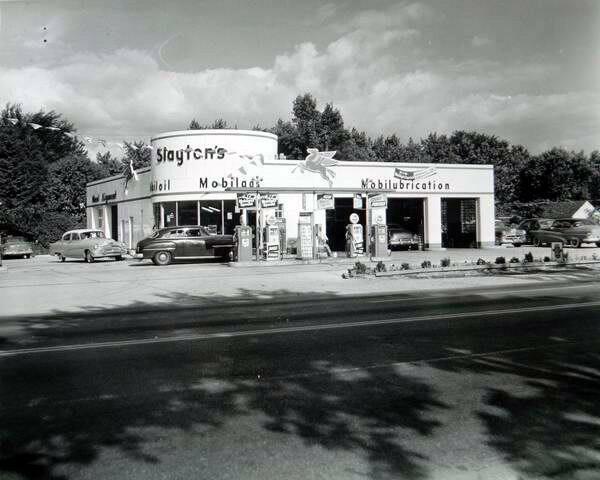 This led to the next phase of development, the gas station. These were dedicated drive-thru facilities that kept the pumps safely off the street and elevated on platforms, with a glass measuring device. One of the first gas stations was owned by John McLean, who opened a location in Seattle for Standard Oil of California in 1907. 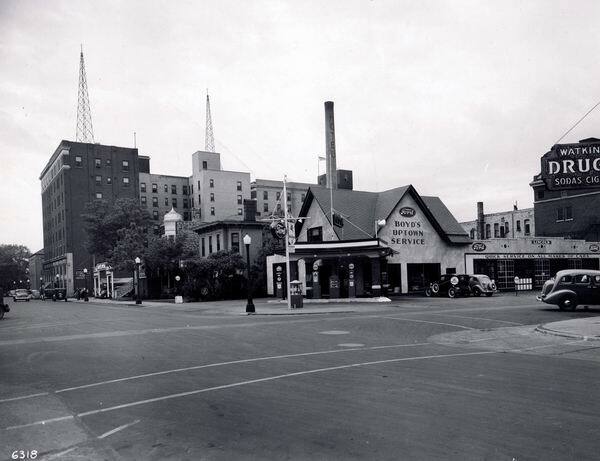 Where the FIRST gas station actually appeared is in dispute. 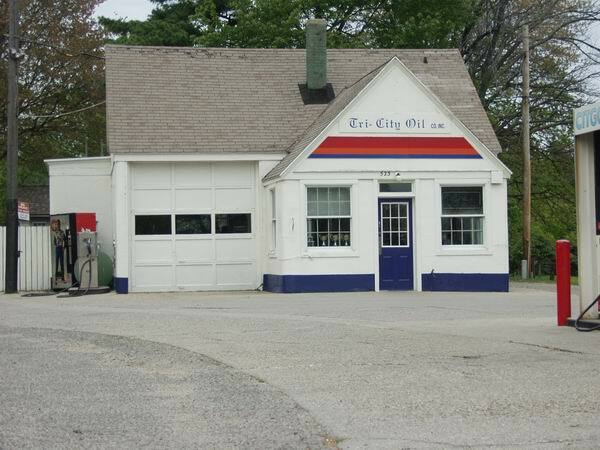 Over the next several years, improvements were made that further advanced the gas station toward what we know today. Some of these include underground tanks (1902), the sight glass and audible bell (1910), and the illuminated globe for advertising (1912). By the late teens, the visible pump became the preferred design as it allowed the customer to see the product through the glass cylinders which had measuring indicators on the side. This development led to the major oil companies using colored dyes to distinguish their particular brand of gas from the competition. Texaco used green, Esso was red, and Sunoco was blue. Although the visible pump was popular, a problem arose when the sun shining through the cylinder caused a film to form on the inside, which was quite unsightly. Corning Glass Works then came up with a special blue-tinted glass that blocked the ultra-violet rays, which prevented this scum from forming. The next logical step was to motorize the pumping process which happened by 1923. The accurate measuring of the output was vastly improved by the arrival of metered pumps by 1929, which measured both the gallons and the total price of the gas. These early pumps can be recognized by the "clock face" that appears on the front of the pump with the large hand pointing to gallons and the small hand indicating 10ths of gallons. Gas pumps continued to evolve over the next several decades, with the additions of a nozzle shutoff, self-retracting hoses and the ability to sell different fuel blends from one pump. 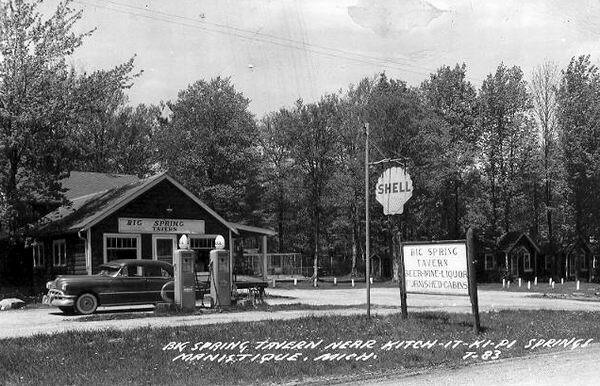 Although dedicated gas stations were cropping up fast, they were still outnumbered by the 18,000 or so garages selling gas by 1920. 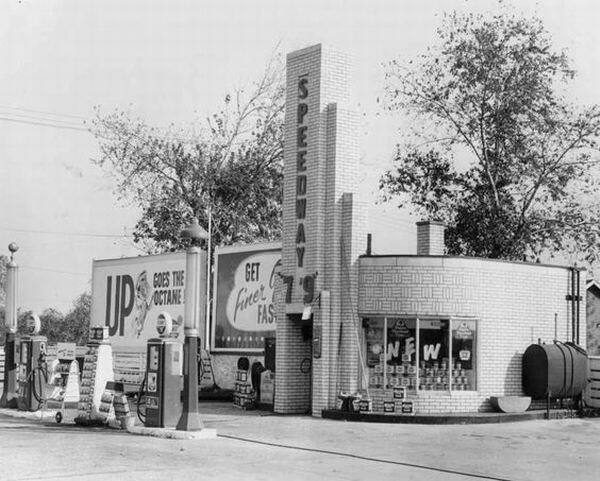 It was during the mid-teens and early twenties that the gas station began to get more elaborate in both design and architecture. Greek revival and even Oriental designs had appeared by then. It was during this time when the array of services available was expanded to include providing road maps (although the federal numbering system for highways we use today was not adopted until 1926), lubricating oil, repair facilities and auto parts sales. 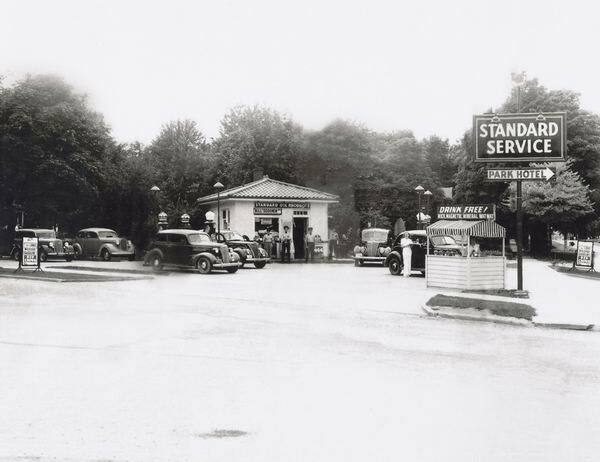 These improvements led to 12,000 filling stations operating by 1921, and 143,000 by 1927! 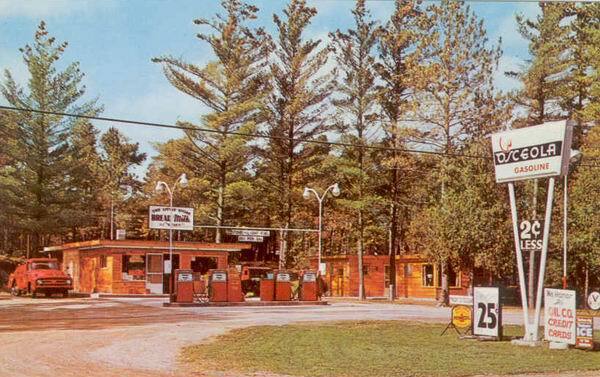 This was certainly the heyday of the gas station business, with ever more elaborate and beautiful locations opening weekly. By the 1930's, customer service was heavily promoted as a way to increase business with numerous, uniformed attendants checking the oil, cleaning the windows, filling the radiator as well as pumping the gas. The repair business was also becoming quite lucrative for many locations. Large, nation-wide chains were launched, with Shell, Citgo, Pure, Phillips, Texaco and Standard Oil leading the way. It was during this period that the classic Deco-Moderne design began to appear, with its streamlined details and use of glass block and striped paint themes. By 1940, there was a staggering 231,000 gas stations in the U.S. This wild expansion raised the bar even higher and encouraged operators to come up with even more, elaborate, eye-popping designs. 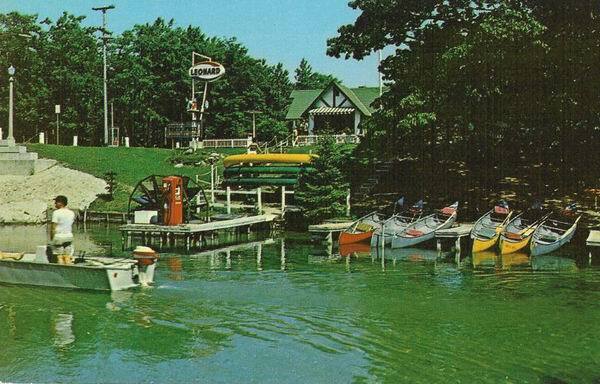 Windmills, teepees, dinosaurs, planes and space-age googie design queues were incorporated into many stations. Elaborate ad campaigns, sometimes with celebrity endorsements were deployed to promote one brand or another. There was also a movement to emphasize cleanliness in the restrooms, which was something that had been neglected prior to this. Some might say we still have a problem with the maintenance of restrooms to this day! 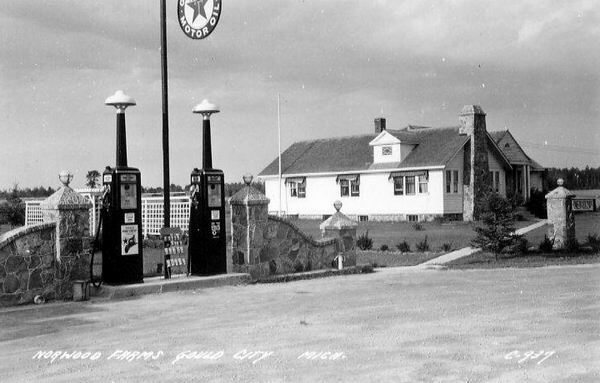 The next milestone that had a dramatic effect on the history of the gas station was WWII. Many of the men who worked at the gas stations had to report for active military duty and there was rationing of gas and rubber. This of course had a slowing effect on business but when the war ended, there was a boom in auto sales and travel so the industry quickly became stronger than ever. 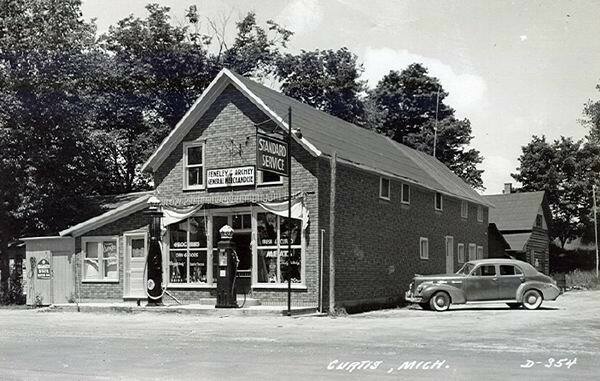 The early and mid 1950's saw increased growth and customer service continued to be a key factor in the success of any gas station. This was also the emergence of suburban America and the interstate highway system, which caused a shift to a somewhat "stripped down" design. 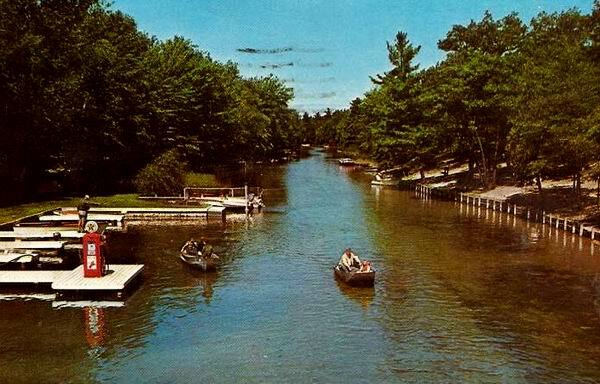 By the late 1950's and early 1960's, the so-called highway beautification movement, led by Ladybird Johnson, began what was to become a permanent, and I would say unfortunate, attitude. It was the notion that anything that stood out visually or that was in any way "flashy" was unsightly and needed to be gotten rid of. 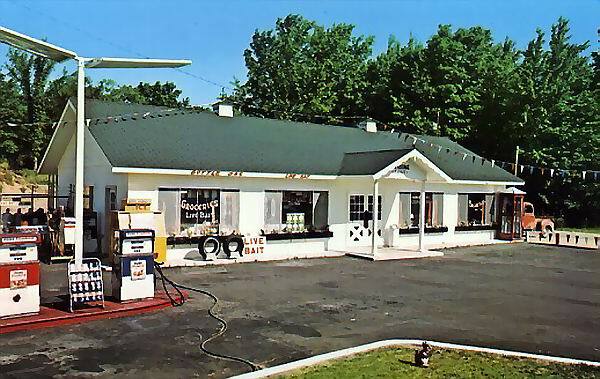 This homogenization was also driven by the large interstates by-passing the smaller highways and towns where many of the classic service stations were located. Many of the classic stations began to close down, while most of the new stations, which were mostly franchised units by then, were usually very dull and non-descript in their appearance. 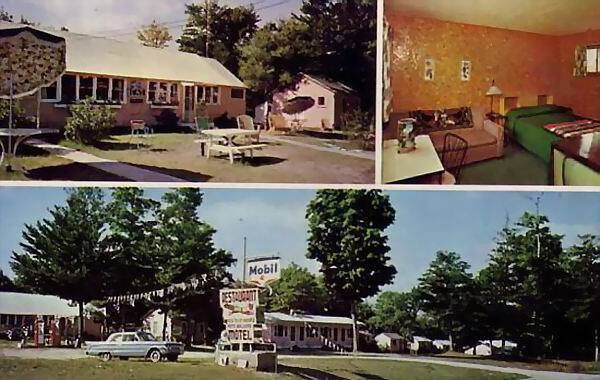 There was a small effort in the 1960's to make gas stations more "attractive," to create some individuality, but the result paled in comparison to the old classic stations. The final nail in the coffin of the classic service station came during the oil embargo of 1973, when prices sky-rocketed and the speed limit was reduced to 55 miles per hour. As fuel efficiency became a priority, and recreational driving reduced significantly, this caused a marked decrease in overall fuel consumption. Although there had been self-serve stations around since the 1960's, they became the norm by 1982 with 72 percent of all service stations going self-serve. Another significant development in the history of the service station was the selling of convenience store items. 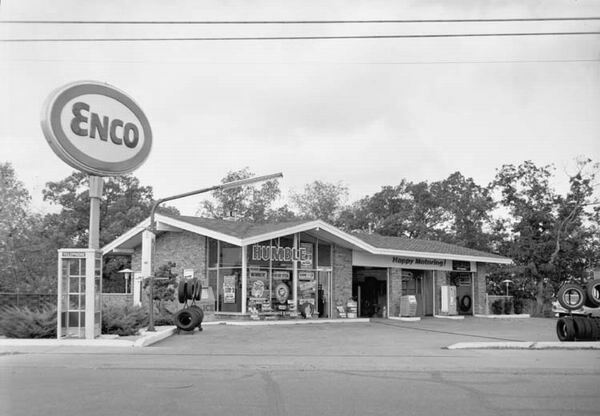 Since the 1970's, Dallas-based Southland Corporation had been selling gas in 8000 of its 7-11 convenience stores. By the 1980's however, many of these outlets were having trouble staying afloat financially. 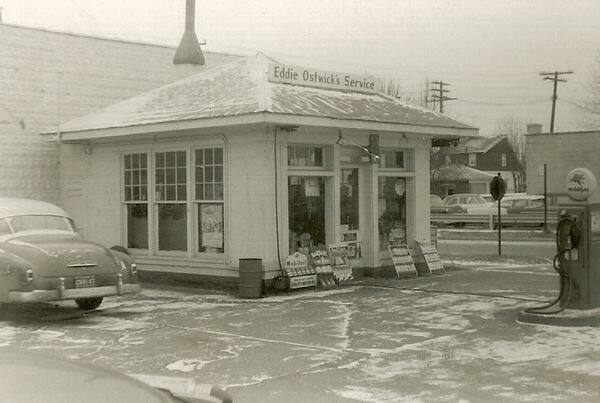 This was when the major oil companies began to sell groceries and other convenience items at their service stations. What were once auto repair bays became aisles stocked with beverages and food. From that point forward, the large chains began designing their new units as self-serve locations with convenience stores built in, almost as if the selling of gas was secondary. By 1990, the number of gas stations had dropped to 111,657, with less than half of them offering auto repair services. 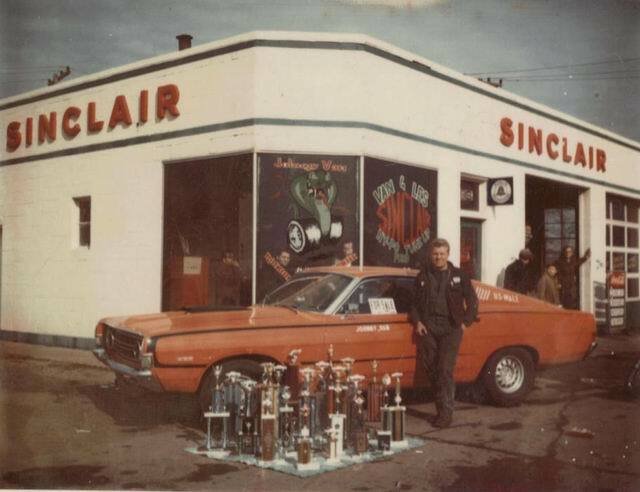 This of course led to the specialty auto repair shops we see today, such as the Jiffy Lubes, Tuffy Mufflers and the rest of that genre. Another issue that had been simmering below the surface was the old fuel storage tanks that were buried underground, many of which had suffered leaks because of their age and corrosion. Strict new environmental laws were being enforced and many independent station owners could not afford the significant cost of having the old tanks removed and the tainted soil hauled off. 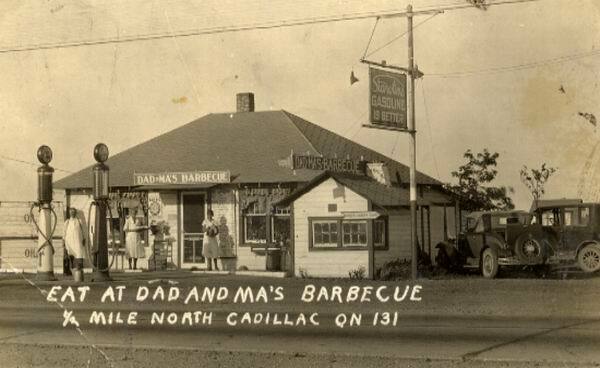 This led to hundreds of abandoned gas stations dotting the countryside, with some of them being converted to other business outlets of many different variations. As of 2004, you can still see some classic examples of the genre on the secondary roads that run all over the state such as US-12, US-131, M-60, US-10 and many others. Most of them are probably not selling gas however, but occasionally you will see some of the old classic pumps still standing like statues, serving as a reminder of what once was. Most of these pumps however, have been sold into the gas station memorabilia market with many of them bringing several thousand dollars if they are in good condition.